Troy Bradford went on a bit of a roll in 1990, and he carried it over from college to the pros. At the University of Arizona, Bradford threw three consecutive complete games, winning each. The three also happened to be the final outings of his college career. From there, he moved to the Cubs organization, taken as a high draft pick. Landing at short-season Geneva, Bradford started seven games, going 5-0 and turning in a 1.79 ERA. He also earned a promotion to single-A Peoria. Bradford, though, wasn't able to turn that fast start into a major league career. He went on to play in six professional seasons, but he never made it past AA. Bradford's professional career began that year in 1990, taken by the Cubs in the second round of the draft, out of Arizona. With the Cubs, Bradford got those seven starts at Geneva. Moving to Peoria, Bradford cooled off. With Peoria, Bradford went 2-6, with a 4.47 ERA. Bradford moved to high-A Winston-Salem in 1991, going 9-5 with a 2.59 ERA. He pitched his third complete game by early June, pitching four on the year. Bradford got his first look at AA in 1992, with two games at AA Charlotte. For 1993, it was back to high-A Daytona. His first extended look at AA came in 1994, with 18 outings, 13 starts at AA Orlando. Bradford went 3-9 there, losing a May decision after pitching five scoreless, then a June one on a home run and a wild pitch. 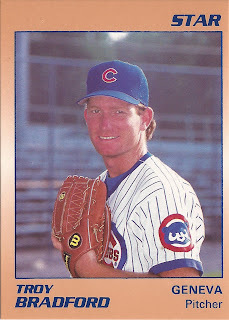 Bradford's career then ended in 1995 with four starts back at Orlando, giving up 12 earned runs in 22 innings of work.